Featuring a Stage IV compliant engine for the first time on a European John Deere tractor, the new 7310R model with e23 transmission will be making its Cereals Event debut in June. This top of the range 7R Series model produces 310hp at rated engine speed, and heads five other new, more powerful tractors from 210 to 290hp. For transport and pto applications, the engine’s intelligent power management (IPM) system provides an extra 30hp and is expected to deliver two per cent better fuel efficiency than previous units. John Deere Stage IV engines are the latest development in the company’s building block approach to meeting emissions regulations. As a final step, John Deere has added a selective catalytic reduction (SCR) system to its diesel-only engines and increased the fuel pressure to achieve more thorough combustion. 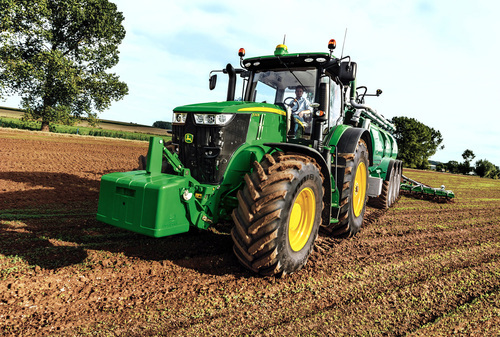 Even with the addition of SCR, John Deere aims to reduce total fluid consumption to even lower levels than at present. The company continues to offer improved Stage III B compliant diesel-only engines on both the new 7R and 8R Series ranges for 2014. By late 2014 there will be a choice of AutoPowr or newly designed, fully automatic e23 transmissions across the whole model range, as well as a CommandQuad transmission on the two smallest models. AutoPowr’s ‘pedal mode’ enables the operator to change the ground speed while operating pto-driven equipment that demands constant engine rpm. The e23 transmission offers 23 equally spaced power shiftable forward gears and 11 reverse, and is equipped with Efficiency Manager. This allows the operator to preset the working speed, and helps to save fuel by keeping the engine rpm at an optimum speed by automatically shifting up and throttling back. A new CommandArm console is standard on all 7R Series tractors and replaces the right-hand console of previous models. Featuring a more intuitive and ergonomic layout, the CommandArm groups the tractor controls by function and integrates completely with the new Generation 4 CommandCentre, which features a new interface and is available with either a 7 or 10in touchscreen display. The new CommandView III Cab has a 40 degree swivel seat with back rest extension, and customers may choose between a standard air spring seat, the field-proven ActiveSeat or hydraulic cab suspension (HCS) for extra driving comfort. The cab features laminated glass for safety and a quiet operating environment, and a refrigerator for storing food and drinks. Integrated systems also enable the use of John Deere’s FarmSight precision farming technology.